Following tradition, the Tallinn Christmas Market will open its stage and sales kiosks this year in order to make it possible for us to enjoy the Christmas spirited fairy tale land as long as possible. In the Town Hall Square, there is already erected a fluffy Christmas tree, the symbol of Christmas, which for the first time in the world was erected right here in 1441. The Tallinn Christmas Market delights everyone with its coziness, historical location, half a century old buildings and long traditions. 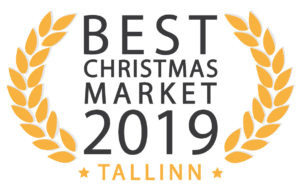 In recent years, the Tallinn Christmas Market has become increasingly visible in the foreign media; itis has a number of times been elected as one of the best in the tens of thousands of Christmas markets. This year, the glances are captured with the heart-shaped ornaments on the Christmas tree towering in the center of the Raekoja Square and on the stage. Heart-shaped decorations were chosen to decorate the Christmas Market for a number of reasons – the heart is a symbol of love, and Christmas is probably one of the most heartfelt holidays in general. But also Tallinn Old Town, the venue of Tallinn Christmas Marketplace, is heart-shaped when viewed from the air, and the City Center advertises itself as the heartof the city! Every year, more than half a million people, guests, andinquisitive people visit the Tallinn Christmas Market from close by and from far away. For children, entertainment is provided by carousels and Santa Claus, who distributes candy in his little house to those who are better at reciting verses. At the site, you can buy high-qualityhandicrafts fromall sorts of nick-nacks to practical winter accessories, andyou can fill your tummy with gingerbread and with hearty Christmas roasts. Among the refreshments are well known Christmas dishes, but also brand new ones that are perfect for Christmas time. Over the Town Hall Square drifts a spicy scent of mulled wine – this hot Christmas drink is served in a very broad assortment, with different flavors, both for children and adults. Tallinn Christmas Market is waiting for everyone to spend Christmas time on the Fairy Tale Land of Tallinn Town Hall Square. 14:00 The choirs of St. John’s Church, Charles Church, Church of the Holy Spirit, Bethel Congregation, the Dome Church, Nõmme Peace Church, Viimsi Congregation and the German Congregation of the Deanery of Tallinn. 14:10 Welcome speeches of Mayor of Tallinn Taavi Aas and dean of Tallinn Jaan Tammsalu. In the Christmas tree, the first advent candle is lit.